This weekend will mark the last of Catholic League football’s non-league affairs. Starting Sept. 16, every game inherits immense importance and intensity. For the first time since 1961, this year’s champions will be determined by regular season records. A tiebreaker — starting with head-to-head results — will be employed should there be two or three teams with the same record. Since 2008, three different teams have been crowned as champions, depending on their enrollment size (4A, 3A, 2A, respectively). This fall, the Catholic League has switched to a two-division format. Among the seven teams in the Red Division (larger enrollment) are 4A champion La Salle, 3A champ Archbishop Wood, perennial juggernaut St. Joseph’s Prep, Roman Catholic, Father Judge, Archbishop Ryan, and Archbishop Carroll. In the seven-team Blue Division (smaller enrollment), 2A champion West Catholic will face Cardinal O’Hara, Bonner-Prendergast, Conwell-Egan, Lansdale Catholic, Neumann-Goretti, and Conwell-Egan. After the regular season will come seeding for the Pennsylvania Interscholastic Athletic Association (PIAA) tournament. This year, there will be five classes (6A, 5A, 4A, 3A, 2A). Determining the respective PIAA representatives will require playoff games that follow the last week of the regular season. Below is a summary of each team in the Catholic League. Early Team Leaders – OL Anthony Sabol, Sr.; FB/LB Rich Melito, Sr.; DB Khadir Roberts, Sr.; RB Christian Smith, Sr. So Far in 2016 – The Patriots are 0-2. Smith has gained 90 yards and a touchdown on 19 carries. Quarterback Steve Honick (25 for 52, 448 yards, two touchdowns) has connected with Jay Smiley five times for 195 yards and two scores. Dahmar Ruffin has added eight catches for 123 yards. Last Year’s Record – 8-4; Lost AAA final to Archbishop Wood, 35-7. Early Team Leaders – RB Jaye McNeil, Jr.; QB/P Matt Romano, Sr.; OL Drew Obuchowicz, Sr.; OL Brendan Ruskowski, Sr., DB Shamar Edwards, So. ; OL Mike O’Brien, Sr.; DE Shawn Connor, Sr. So Far in 2016 – The Raiders are 2-0 and have outscored their opponents by 80-19. McNeil has been on a mission, having already amassed 427 yards and seven touchdowns on 42 carries. Romano has completed 14 of 27 passes for 165 yards and a touchdown. 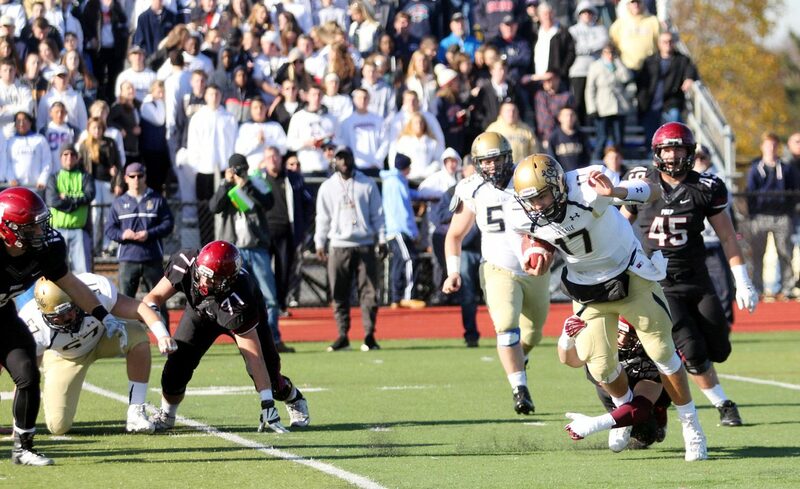 Last Year’s Record – 11-1; Won AAA title, 35-7, over Archbishop Ryan. Lost in city title. Early Team Leaders – RB/DB Raheem Blackshear, Sr.; WR Mark Webb, Sr.; TE/DL Anthony Diodato, Sr.; FB Shawn Thompson, Sr.; LB Matt Palmer, Jr.; K Dan Zanine, Sr. So Far in 2016 – The Vikings are off to a disappointing, and weird, 0-1-1 start. A 21-21 tie in Wayne, Ohio, was cancelled in the second quarter because of weather concerns. A 34-16 loss to rugged Bergen Catholic showed rare defensive lapses. Blackshear has accrued 193 yards and two touchdowns on 22 carries. Thompson has added 64 yards on 12 rushes. Sophomore quarterback Jack Colyar has found success when firing to Webb, who has already caught 10 passes for 145 yards and a touchdown. Early Team Leaders – QB Rob King, Sr., WR/DB Justin Gies, Sr., DL Savion Perez, Sr.; DL Dom Carey, Sr.; DL Earl Volz, Sr.; WR/DB Jeremy Smith, Sr. (Transfer from Archbishop Ryan); LB Mark Kellam, Sr.; WR Frank Conway, Sr.; DB Alex Schaeffler. So Far in 2016 – The Crusaders are 2-0 and have outscored their foes by 75-14. King has been unstoppable both passing (21 of 28, 297 yards, five touchdowns) and rushing (190 yards and two scores on 21 carries). Gies (10 catches for 135 yards and three TDs) has been the go-to receiver; Steve Arrington snared three interceptions in a season-opening win over Council Rock South. Last Year’s Record – 8-4; Won AAAA title, 29-28, over St. Joseph’s Prep; Lost in PIAA quarterfinals. Early Team Leaders – OL Chris Maloney, Jr.; TE Liam Trainer, Jr.; RB Syaire Madden, Sr.; LB Austin Lemke, Jr.; OL/DL Garrett Zobel, Jr.; QB Tom LaMorte, Sr. So Far in 2016 – The Explorers are 1-1, including a 28-0 win over Pennsbury highlighted by LaMorte’s four touchdown passes and a terrific all-around team defense. Coming off a sensational junior season ((14 touchdowns and 1,213 yards), Madden has already carried 51 times for 311 yards and two TDs. Early Team Leaders – DL Dan Edwards, Sr.; LB Matt Galasso, Sr. OL Joshua Kellogg, Sr., DB Shane Flaherty, Sr.; WR/DB Joey Bristow, Sr.; DB Dahmeer Duvernay, Sr.; QB Anthony Butler, Sr. So Far in 2016 – The Cahillites are 1-1 and displayed talent both running (AJ Gaymon 32 carries for 244 yards and four touchdowns; Marquise Cooper 19 for 111 yards ) and passing (Butler 21 of 37 for 225 yards and two scores). Last Year’s Record – 7-3; Lost AAAA final, 29-28, to La Salle. Early Team Leaders – RB D’Andre Swift, Sr.; DB Richard Carr, Sr.; LB James Johnson, Sr., C Mack Grey, Sr.; OL Jackson Evans, Sr.; WR Darryle Simmons, Jr.; Terrence Greene, Sr., LB/FB Phil O’Connor, Jr.; QB Marquez McCray, Jr. So Far in 2016 – The Hawks’ season opener last week produced one word: Wow. A 49-17 win at California’s Oaks Christian served noticed that the Prep wants to return to the glory days of 2013 and 2014, when they captured both the Catholic League and PIAA Class AAAA state championships. University of Georgia-bound running back D’Andre Swift might be ready to play college ball right now. Against Oaks, Swift scored the first two times he touched the ball and finished with 303 yards from scrimmage – 128 on 14 carries, and 175 on three receptions. He scored four touchdowns – two rushing, and two receiving. Junior QB Marquez McCray contributed a solid 14 of 22 passing for 287 yards and two touchdowns. Last Year’s Record – 7-7; Lost in PIAA Class A quarterfinals. Early Team Leaders – OL Dan Church, Sr., TE Jayvonne Campfield, Jr.; DL Nasir Pettus, Jr.; WR Jaron Macon, Jr.; RB/LB Diavante Lloyd, Sr.; QB Max Bryson, Sr. So Far in 2016 – The Lancers are 1-1 and have scored 64 points. Lloyd has rushed for 227 yards and five touchdowns on 31 carries while QB Bryson has added 93 on 15. Bryson has also thrown for 262 yards and three touchdowns. McDevitt’s secondary has intercepted two passes. Early Team Leaders – RB/LB Joe Hartley-Vittoria, Sr.; DL Mike Larsen, Sr.; LB Jordan Mosley, Jr.; RB/DB/P Tom Millison, Sr.; QB Evan Raiburn, Sr.; WR/DB Brandon Bettole, St.; WR Alex Cole, Sr.; WR/DB Kyrin Jackson, Jr.; RB/LB Billy McGoldrick, Jr. So Far in 2016 – The Friars’ 1-1 record includes big efforts from Hartley-Vittoria (36 carries for 143 yards) and Raiburn (19 of 36, 307 yards, three TDs). Early Team Leaders – OL/DL Des Holmes, Sr.; OL/DL Stephen Brown, Sr.; LB Brandon Borcky, Jr.; LB Tyric Gould, Jr.; LB Jamir Redd, Jr.; WR/DB Justin Santilla, Jr. So Far in 2016 – The Lions have already doubled last year’s victory total. Their 2-0 record is far from a mirage, as suggested by a 77-6 advantage in scoring. Myles Henderson (14 carries for 133) and Te’Ron Johnson (14 for 131) have supplied a one-two punch while Nick Kutufaris has added 102 yards on nine carries. Through the air, the aptly-named Tommy O’Hara has completed 14 of 22 passes for 156 yards and three touchdowns. Santilla has caught six passes for 60 yards and two scores. Early Team Leaders – MP Kyree Bronson, Sr.; LB Brandon Cohen, Sr.; DL Keanan Baines, Sr.; LB Danny Bentley, Sr.; WR/DB Danny Green, Sr.; QB/DB Kendall Jones, Sr.; RB Pat Garwo, So. ; DT Dwayne Majors, So. So Far in 2016 – The Eagles are 1-0, defeating Archbishop Carroll, 21-7. Garwo has amassed 234 yards and three touchdowns from scrimmage. QB Jones has added 60 yards on eight carries. “If we finish the year with the key players we start the year with, we will be competitive with every team on our schedule,” said coach Jack Techtmann. Last Year’s Record – 8-3; Lost AA final, 7-6, to West Catholic. Early Team Leaders – DT Ifeanyi Okorji, Sr.; QB Mike Basilii, Sr.; LB Dave Saulino, Sr.; OL Nate Ensanien. Sr.; OL Nolan Dougherty, Sr.; WR Bob Bausman, Sr.; RB Matt Casee, Jr.; DE Tyler Scheetz, Sr.; DE Andrew Huggins, Sr.; DB PJ O’Connor, Jr.; LB Jake Doheny, Jr. So Far in 2016 – The Crusaders are 0-1. Casee gained 68 yards on eight carries in defeat. Early Team Leaders – WR Maurice Mazzccua, Jr.; TE/WR/LB Emil Moody, Sr.; RB Keith Jenkins, So. ; QB Brandon Tucker, Sr. So Far in 2016 – The youthful Saints are 0-1, and another game was cancelled because of a hurricane threat. A 65-yard TD toss from Tucker to Aiden Brown provided future promise. Last Year’s Record – 10-5; Won AA title, 7-6, over Lansdale Catholic; Lost in PIAA semifinals. Early Team Leaders – RB Calil Wortham, Sr.; FB Supreme Kemp, Sr.; LB/P Rovny Da’Silva, DB Dajone Averett, Sr.; WR Amadou Barry, Sr.; MP Ahmad Kent, Sr.; OL/DL Josh Taylor, Sr.